Easy online buying process. Always up to date products and quality of product is next to none. Customer Service is easy and reliable. Looking forward to getting more...soon! Thanks for all you do for the Mini Car Clubs! MINI Cooper Acccessories + MINI Cooper Parts :: OutMotoring.com MINI Blog :: MINI How To + DIY :: You've got our support! Synopsis: Out Motoring's MID Light Brackets are here for you. 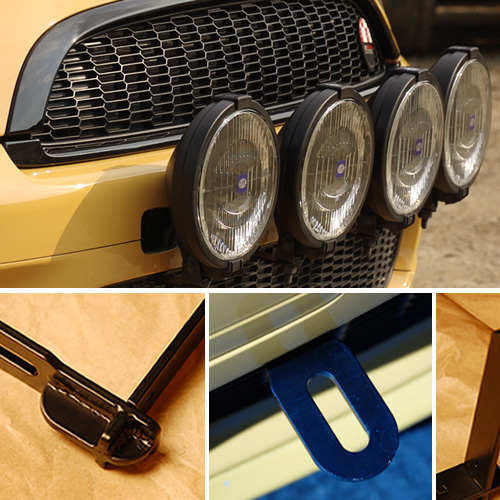 Out Motoring Gen 2 MID Light Brackets are the perfect way to add aftermarket driving or fog lights to the gen 2 MINI Cooper. This set of 2 brackets (sold as a set of two) installs to the bumper structure behind the bumper surface and is compatible with nearly every major light including PIAA, Hella, IPF and more. Brackets do NOT include lights or wiring. We have a number of great options on our site that will work great with these brackets. On our project car, we ran 2 sets of these brackets (4 total) and installed 4 of the biggest lights we could find (Hella Black Magic which are basically the Rally 1000 at nearly 6.5" diameter) and had a bout 3/4" between each light with our installation, but they could have been mounted even further out. While mounting just a pair of lights will certainly add a fair amount of extra light, running 4 is like adding flame throwers. Brackets are made of heavy gauge steel and are powder coated black for a durable long lasting finish. Includes mounting hardware and replacement snaps for the front fenders. Installation requires that the bumper be removed and slots created in the lower plastic grill to allow the the actual brackets to protrude. Generous slot on the actual bracket allows a range of lights to be positioned within a 1.25" range. The position of the lights does not interfere with the intercooler on the Cooper S model and can be installed in conjunction with the factory Fog lights. What are you waiting for? Check them out for yourself! Comments on You've got our support!